Please call the bar to make sure that your beer of choice is on tap. 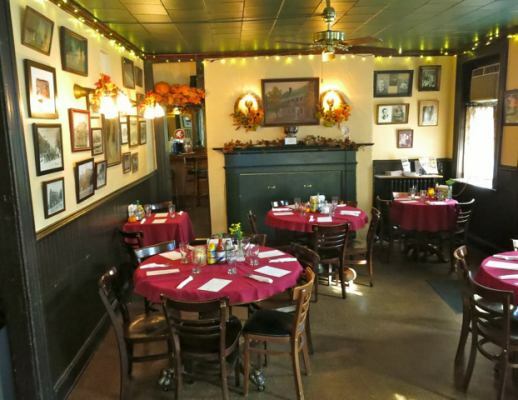 Shank’s Tavern is known for a lot of things: it’s friendly neighborhood atmosphere; its eclectic nightly specials; and it’s jovial owner, Bob Shank. Family owned since 1930, Shank’s Tavern was built in 1814 by a retired riverboat captain by the name of James Stackhouse. Three years before the end of Prohibition, John and Kathryn Shank, Bob’s grandparents, bought the tavern from Ernest Maulick, a local brewer. Mr. Shank, grew up in the business, and fondly remembers hiding behind the jukebox as a kid, watching the locals as they enjoyed a cold one. Over time, the magic that is evident as soon as you walk through the door seems to be more like an accident than a well-thought out plan. Bob has cultivated the kind of place where the staff functions like a family. Stop by on any given evening and you’ll find Mr. Shank working his way around the bar, greeting patrons, tapping a beer, delivering food and even washing dishes. And yes, there are ghosts, just ask Bob or any of the staff. They all have a story to tell! When the microbrew revolution began, Shank’s was in on the ground floor. Back when the popular beer on tap was Old Milwaukee, Shank’s added another Beer Meister so they could bring in this hot new beer called Red Feather. Today, Shank’s boasts eight taps, most of which pour a constantly rotating selection of craft beer, all of which run through a state-of-the-art glycol system. In addition, you’ll find a German Hefe Weizen on tap year round. An assortment of other craft beer and imports are also available in bottles. Shank’s also boasts an extensive selection of tequila and fine liquor. As for food, Shank’s offers an wide-ranging assortment of homemade soups, sandwiches, salads and personal pizza’s incorporating gluten-free, low-carb and vegetarian options and always using market fresh produce. Nightly specials include Pho’ and Spring Rolls on Tuesdays; Mexican fare on Wednesdays; Beef on Weck ( a roast beef sandwich which originated in Buffalo, NY) on Thursdays; and hand-rolled Sushi, Steamers and fresh-made Jumbo Lump Crab Cakes on Friday’s. If you’re getting the feeling that Shank’s Tavern is a one-of-a-kind, warm and friendly corner bar-you would be right! With a seasoned and dedicated staff, the third generation of Shank’s continues to maintain a friendly old-time neighborhood establishment with simple fare and fine spirits for the comfort and convenience of its patrons. Stop by and see for yourself! We’d love to see you! Rent the bar on a Saturday or Sunday for the low price of $275. Call or email to reserve your date!